I know, I know. Two Best TV Moments posts in one day from the same week of television. But, c'mon, it's season finale time and there's not likely going to be much greatness coming out of summer TV (SYTYCD excluded, natch). And there's no denying that what happened last week on Game of Thrones was pure, amazing television. Not funny or heartwarming like some of the previous featured moments. Just balls to the wall, jaw-dropping, awe-inspiring television. In the interesting of not spoiling it, I'll continue raving about the awesomeness of Blackwater after the jump. Just remember, spoilers ahead! But do I really have to say anything after that clip? Okay, fine. It's no secret that Game of Thrones is a slow boil—there's a lot of pieces to move around the board in order to set up a single event. Like the Ned Stark beheading in Season 1, it seems much of Season 2 was slowly working its way toward the much-anticipated battle of Blackwater. Having not read the books, I wasn't sure what to expect and a part of me feared that it'd just be a recreation of the Helm's Deep battle from The Lord of the Rings on a TV budget. Luckily, they managed to squash any doubts I had and rise above any expectation. The tension leading up to the battle and the anticipation of just how Tyrion planned to use the wildfire (because obviously that was going to be factor in the battle) had me on the edge of my seat. 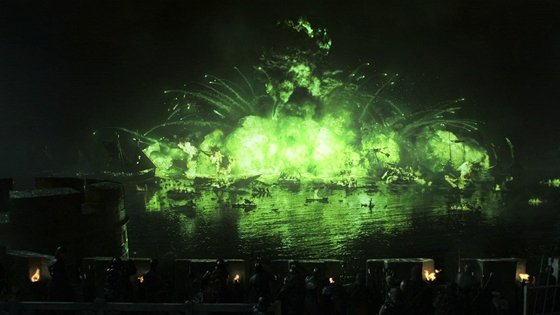 And when Bronn's arrow landed in the water and ignited the green flames of death, I couldn't do anything but sit there, jaw dropped and eyes wide, as Stannis' massive fleet evaporated into thin air. The battle, of course, raged on as the Baratheon troops stormed King's Landing and the epic greatness of the scene continued as Joffrey abandoned the troops to hide safely in the Red Keep and Tyrion gave his impromptu and impassioned speech to the King's Guard, ending with the perfectly delivered, "Those are brave men at our door. Let's go kill them!" Sorry, everyone else who is a supporting actor in a drama series. The Emmy is going back into the hands of Peter Dinklage. I'm sure I could go on for another couple hundred words about how amazing this scene was, but just do yourself a favor and rewatch that wildfire clip. Because... wow.